Her resignation letter , obtained by The Associated Press, had not a whiff of controversy unlike others who have left from the administration. "Despite our progress in reforming homeland security for a new age, I have determined that it is the right time for me to step aside," she wrote. "I hope that the next secretary will have the support of Congress and the courts in fixing the laws which have impeded our ability to fully secure America's borders and which have contributed to discord in our nation's discourse." 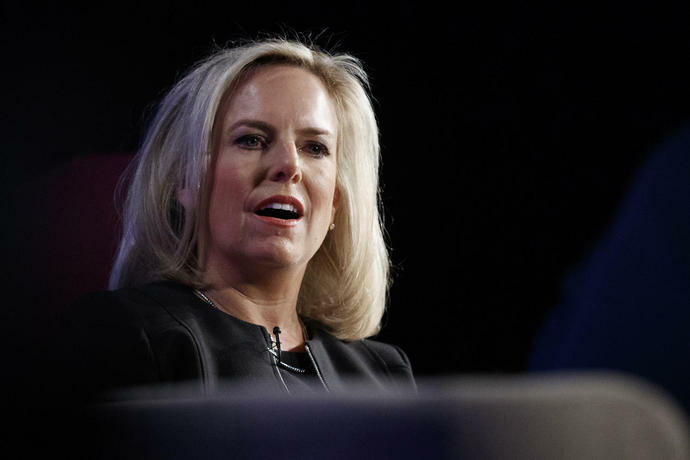 There have been persistent tensions between the White House and Nielsen almost from the moment she became secretary, after her predecessor, John Kelly, became the White House chief of staff in 2017. Nielsen was viewed as resistant to some of the harshest immigration measures supported by the president and his aides, particularly senior adviser Stephen Miller, both on matters around the border and others like protected status for some refugees. Once Kelly left the White House last year, Nielsen's days appeared to be numbered. She had expected to be pushed out last November, but her exit never materialized. And during the government shutdown over Trump's insistence for funding for a border wall, Nielsen's stock inside the White House even appeared to rise. Arrests all along the southern border have skyrocketed in recent months. Border agents are on track to make 100,000 arrests and denials of entry at the southern border this month, over half of which are families with children. Nielsen advocated for strong cybersecurity defense and often said she believed the next major terror attack would occur online - not by planes or bombs. She was tasked with helping states secure elections following Russian interference during the 2016 election. She dutifully pushed Trump's immigration policies, including funding for his border wall, and defended the administration's practice of separating children from parents, telling a Senate committee that removing children from parents facing criminal charges happens "in the United States every day." But she was also instrumental in ending the policy. Under Nielsen, migrants seeking asylum are waiting in Mexico as their cases progress. She also moved to abandon longstanding regulations that dictate how long children are allowed to be held in immigration detention, and requested bed space from the U.S. military for some 12,000 people in an effort to detain all families who cross the border. Right now there is space for about 3,000 families and facilities are at capacity.